The importance of the ancient symbol of the Ankh simply cannot be overstated. 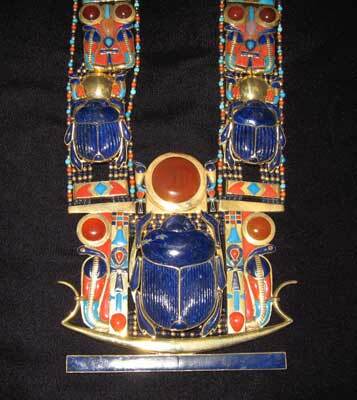 It is a symbol of eternal life, and as such it is closely associated with two other important ancient symbols, the Scarab and the Djed-column. Previous posts have explored the abundant evidence which suggests that the Ankh (along with other cross-symbols) represents the two natures which join together in our human existence: the material or animal nature symbolized by the horizontal bar, and the spiritual nature, symbolized by the vertical column, which in the case of the Ankh is surmounted by the circle representative of the infinite or the unending. The Ankh as a symbol is closely related to the Djed column, which is also depicted as having a horizontal component (when the Djed is cast down, representing our physical incarnation in "animal" matter) and a vertical component (when the Djed is raised up, representing the uplifting of our spiritual nature and representative of spiritual life). So, the connection between the symbology of the Ankh and the symbology of the Djed is fairly straightforward and easy to understand. But, how are these two symbols connected to the symbol of the Scarab? Let's examine the question more closely -- the answer contains many breathtaking connections and sheds light on the exquisite profundity of the ancient wisdom, bequeathed to us in the mythology and symbology of the human race. On either side of the Scarab, just outside of the two Ankh-adorned columns, are two uraeus serpents, each with a solar disc above its head, and above the upraised arms of the Scarab itself is another, larger solar disc. On either side of this larger solar disc are yet two more uraeus serpents, and suspended from each is another Ankh. As can be seen from the image above, this elaborate ornament continues on beyond the section in the close-up view shown above: the wide "straps" of the necklace on either side are adorned with another pair of Scarabs, each of which are surmounted by another solar disc (not shown in the image above), this time in gold, and again flanked by two uraeus serpents. Above these Scarabs and solar discs can be found yet another pair of uraeus serpents (on each "strap"), this time flanking a central Ankh symbol (on each "strap"). For an image showing more of the necklace, see for instance this web page, which appears to be an image of a replica of the original (the image above is from the original found in Tut-Ankh-Amun's tomb). the Djed column raised up, and also with the constellation of Cancer the Crab, the sign which commences at the point of summer solstice (a fact which is commemorated in the name of the Tropic of Cancer, which is the latitudinal circle designating the furthest north that the direct rays of the sun will reach each year, on the day of the northern hemisphere's summer solstice, at the start of the astrological sign of Cancer). Because the constellation of Cancer itself appears to have outstretched or upraised arms, this "top of the solstice column" is mythologically associated and symbolized by the upraised arms of Cancer the Crab -- and, as we have seen in that same post just linked, by the upraised arms of Moses in the battle against the Amalekites in Exodus 17, as well as the upraised arms of the Egyptian god Shu. And, as that post also points out, the Ankh symbol (which is closely associated with the symbol of the Djed-column "raised up") itself was often depicted with a pair of human arms raised upwards in just the same way (a famous image from the Papyrus of Ani showing the Ankh with upraised arms, surmounting a Djed column flanked by Isis and Nephthys, has been included in several previous blog posts, such as this one). For this reason, we can safely assert that the Scarab in this necklace, surrounded as it is by Ankhs and Djeds, and depicted as it is with upraised arms, is symbolic of the summer solstice, and that the disc above its head must be a solar disc, and the bark on which it and the uraeus serpents are positioned must be a solar bark. The two serpents, by the way, are also closely associated with the vertical Djed-column -- if we imagine the ancient symbol of the caduceus, we will instantly perceive that these two serpents are positioned on either side of all these central (spinal) column images (the Ankh, the Djed, and the Scarab) in just the same way that the two serpents are positioned at the top of the caduceus column (and intertwine all the way down). The fact that elsewhere upon the same necklace the two serpents are depicted as flanking an Ankh shows that the symbols of the Ankh and the Scarab are closely connected and practically interchangeable here. In a future post we will explore further the significance of the name of the Ankh itself, following on the illuminating analysis of Alvin Boyd Kuhn on the subject. Some aspects of this important concept have already been touched upon, in this previous post about the ancient Vedic concept of the Vajra, or Thunderbolt, which we saw in that post to be almost certainly connected to the concept of the raising of the Djed column and the "backbone of Osiris." There, we saw evidence from the work of Alvin Boyd Kuhn that the "N - K" sound of the name of the Ankh is linguistically connected to the name of the practice of Yoga (or yonga, in which the "N - G" sound is linguistically related to the "N - K" of the Ankh).